The outcome of business negotiations can be affected by a variety of factors. In particular, those within the meetings industry have noticed over the years that the presence of romanticism, a relaxing environment or an unusual meeting place can, as a rule, bring great results. As journeys into the past go, this exploration of a noble epoch is particularly special. 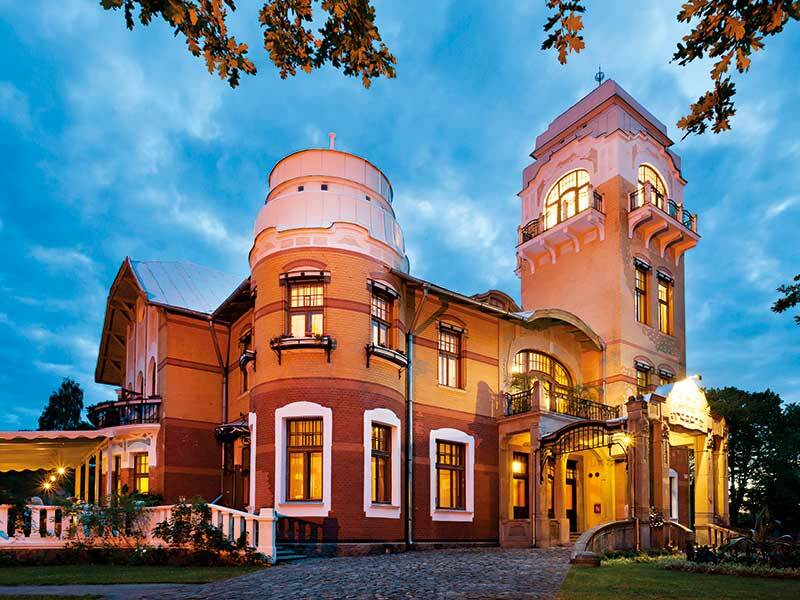 Full of intricate, traditional detailing and complemented by one of the highest-rated restaurants in Estonia, Luxury Art Nouveau Hotel Villa Ammende manages to vividly recreate the atmosphere of a wealthy merchant’s home at the turn of the 20th century. The hotel’s guestrooms, lounges and halls are all furnished with carefully renovated original Art Nouveau furniture and decorative items, including authentic paintings, woodcarvings, candelabras, antiques and hunting trophies. The property itself deftly combines the feel of a luxurious modern guesthouse with traditional, old-fashioned elegance. Ideal for business meetings, romantic weekends and relaxing holidays, Villa Ammende is a step back in time to a bourgeois era when material wealth matched manners, quality and refinement. This unique era in Estonia’s history, in addition to reflecting the country’s colourful past, has also enabled the historic hotel to occupy a distinctive place in this remarkable country’s present. Widely considered to be the best-restored Art Nouveau hotel in Europe, as well as a valuable architectural landmark in Estonia, this historical grand mansion offers old-school hospitality supported by sophisticated, modern amenities. Villa Ammende’s enviable location and unique property solutions allow for a wide variety of official events in various different sizes, including business meetings, diplomatic receptions, festive gala events and balls. The hotel complex and its gardens are surrounded by a secure fence, providing guests and event organisers with a safe environment in which to meet. Furthermore, the entire complex can be rented to a single company at once if required. Our enthusiastic workforce, led by an experienced management team, has been organising high-level international meetings and major events since 1999. We do not offer standard solutions – each booking is supported by a tailor-made plan, guaranteed to provide perfect results for guests. Villa Ammende’s restaurant offers a selection of refined cuisine. Guided by Michelin-starred chef Michel Husser from Alsace, France, the restaurant’s menus feature fresh, local produce and a wide selection of seafood. Dinner or lunch can also be taken on the outdoor terrace, which overlooks the stunning park garden and fountain. A fabulous breakfast featuring an extensive cold buffet and à la carte hot dishes is served in the Blue Hall. Across the rest of the hotel, we offer accommodation in the form of 17 guestrooms and suites, with a maximum capacity of 35 people. The rooms, which range in size from 30sq m to 100sq m, are complemented by conference facilities for up to 80 guests, six comfortable lounges, and an extensive library. All rooms are equipped with original Art Nouveau furniture, Egyptian cotton bed linen, Bvlgari cosmetics and 24-hour room service. Villa Ammende is also capable of hosting receptions for up to 250 guests indoors and 2,500 guests outdoors, offering a concierge service, full catering services and free Wi-Fi across the property. There is also a range of social indoor activities available for guests, including afternoon tea, etiquette training with an international tutor, wine and spirit tastings, cooking classes and a poker club. Outdoor activities include picnics in the hotel gardens, yachting on Pärnu Bay, hunting trips, rally racing experiences, and golf courses and tennis courts in the nearby vicinity.